The remarkable effects of Ginkgo biloba on brain function and circulation have made this venerable tree one of the most extensively studied and widely used botanicals in the world. Millions of Americans and Europeans now enjoy the benefits of ginkgo for memory, cognitive function, circulatory disorders, and conditions of the eyes and ears. No other known circulation enhancer, natural or synthetic, can increase blood flow not only to healthy areas of the brain, but also to areas already damaged by disease. 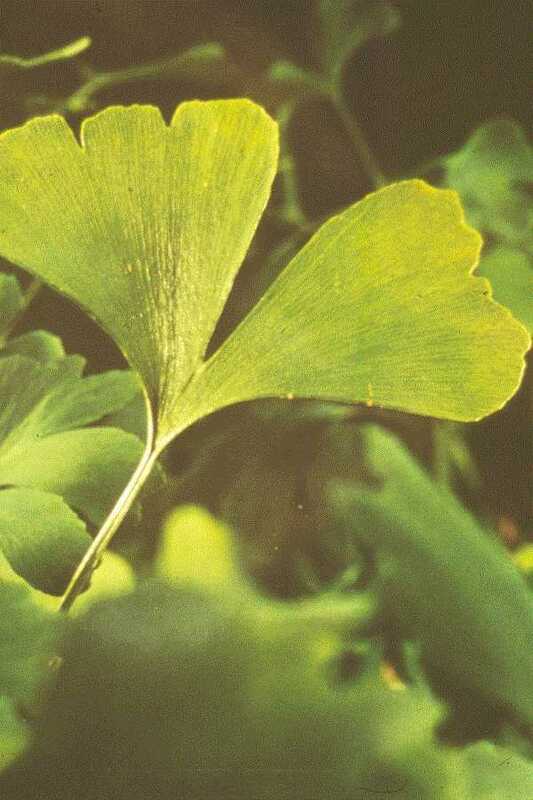 In addition, ginkgo's powerful antioxidant effects have earned it an international reputation as an "anti-aging" herb among young and old alike. Ginkgo has been used as food and medicine for more than 4,000 years, and traditional Chinese herbalists still rely on the plant for the treatment of asthma, bronchitis, and brain disorders. Often called a "living fossil", the magnificent Ginkgo biloba tree itself is the last survivor of its botanical family. In fact, it is the oldest living tree species known to humankind, and individual trees may live as long as 1,000 years. Beautiful and hardy, this Asian native is widely planted today as an ornamental and can be found lining the streets of many American cities. The wide-reaching benefits of ginkgo are thought to be largely due to its effects as an antioxidant, or free radical scavenger. The plant contains compounds that absorb toxic chemicals, preventing cell damage (including that related to aging). The central nervous system and brain are especially susceptible to free radical damage, and it is believed that gingko's antioxidant action is a major contributor to its "anti-aging" benefits. By preventing free radical damage, ginkgo appears to stabilize cell membranes and render blood vessel walls and red blood cells more flexible, improving the flow of blood and oxygen to the brain, limbs, and other areas supplied by tiny capillaries, such as the eyes and ears. By thus enhancing microcirculation, ginkgo can improve a variety of brain functions, including memory, concentration, and problem-solving. Ginkgo also helps support healthy circulation by inhibiting the effects of a blood clotting substance called platelet activating factor (PAF). The body needs PAF for a number of functions, but excess PAF has been linked to allergies, asthma, inflammatory conditions, and cardiovascular diseases such as stroke. In clinical studies, standardized ginkgo extract has proven effective in improving brain function and quality of life in people with Alzheimer's disease and senile dementia. The extract has been shown to improve circulation to the limbs, reducing symptoms such as coldness, numbness, and cramping. Benefits have also been reported in ear and eye conditions that include tinnitus (ringing in the ears) and dimming vision due to oxygen deprivation. With hundreds of published scientific studies to document its complex and varied effects, Ginkgo is among the world's best studied herbs, and the evidence continues to grow. Current trials are exploring its potential in the treatment of intermittent claudication, asthma, cataracts, drug-resistant depression, hearing loss, head injuries, and a variety of other conditions. Most trials use a ginkgo extract standardized to contain 24% ginkgo flavone glycosides. Enhances microcirculation, improves blood flow and oxygenation to the brain and limbs, protects cells from free radical damage, inhibits platelet activating factor (PAF). Gingko appears to be extremely safe and is well tolerated by most people. No major adverse effects or drug interactions were noted in any clinical trials, and side effects of any kind are rare. The most common side effects are mild gastrointestinal discomfort and headache. However, very large doses may cause diarrhea, nausea, vomiting, and restlessness. Almost all of the clinical research on ginkgo has been done on one form of standardized extract, a 50:1 concentrated extract. Standardization ensures that an extract contains a consistent level of active compounds, and ginkgo extract is standardized to contain 24% ginkgo flavone glycosides. In the clinical studies, the effective dose of the standardized extract was 40 mg three times a day, a total of 120 mg of ginkgo extract a day. Unstandardized Ginkgo extracts are available in tincture, capsule, and tablet form, but there is no clinical research to support the effectiveness of these preparations. Standardized extract capsules, tablets, or tincture: In clinical trials, effective dose was 40 mg three times a day of extract, standardized to contain 24% ginkgo flavone glycosides. The effects of ginkgo are not immediate. In the clinical studies, from 4 to 24 weeks of treatment were required before benefits were observed. The use of ginkgo or other herbs is not a substitute for other medical treatment in cases of serious illness. Many conditions are not appropriate for self-diagnosis or self-medication and require the supervision of qualified health care providers. Be sure to tell your doctor about any herbs you are taking. Educate yourself and use caution when practicing self-care. Ginkgo, Elixir of Youth by Christopher Hobbs. Botanica Press, 1991. Ginkgo by Steven Foster. American Botanical Council, 1990.